Makarios’s presence at Bandung and the enosis movement challenge historians to reconsider the standard assumption that anticolonial nationalism was an Asian and African phenomenon in which the ultimate goal was the creation of independent states. Because the mid-twentieth century enosis movement was both irredentist and anticolonial, it does not fit easily within this common categorization of post-Second World War anticolonial nationalism as a “Third World” movement seeking national independence above all else. In their desire to achieve unification with Greece, the Greek-Cypriot enosis movement was similar to irredentist European nationalisms in the nineteenth and early twentieth century. For enosis advocates, the elimination of British rule was simply one step toward the broader goal of a politically unified Greek nation in which Cyprus was one of many parts. 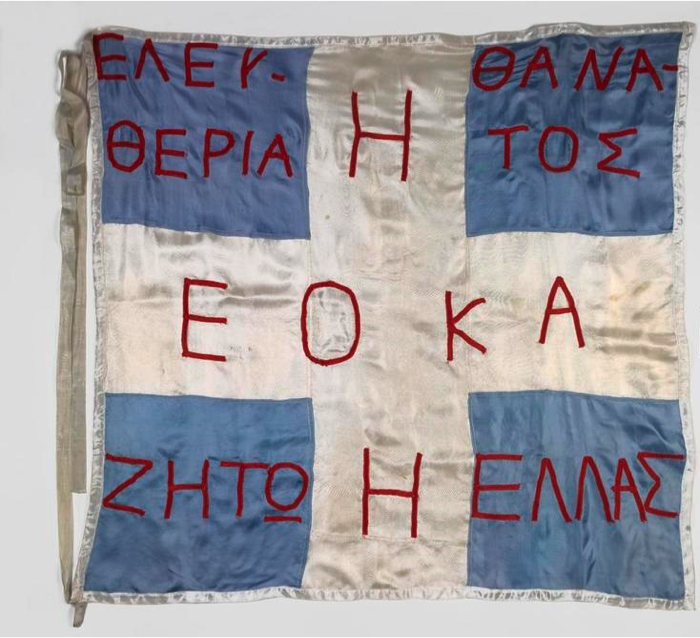 The enosis movement’s connection with Greek nationalism can be seen in insurgent imagery and propaganda. When in 1955 the insurgent group EOKA launched a guerrilla war against British forces, the group adopted an unofficial hymn describing how the “children of Cyprus” would march to the mountains “to go for a new Twenty-one”—a reference to the 1821 Greek independence movement. EOKA’s first propaganda leaflet declared that “the fighters of 1821 are looking to us” and exhorted Greek-Cypriots to join the fight like “the warriors of Marathon, the warriors of Salamis; the 300 of Leonidas.” In their appeal to classical resistance against foreign invasion, EOKA propagandists revived nineteenth-century Greek nationalist tropes that hearkened back to the memory of ancient glory upon which the modern Greek nation-state had been constructed. 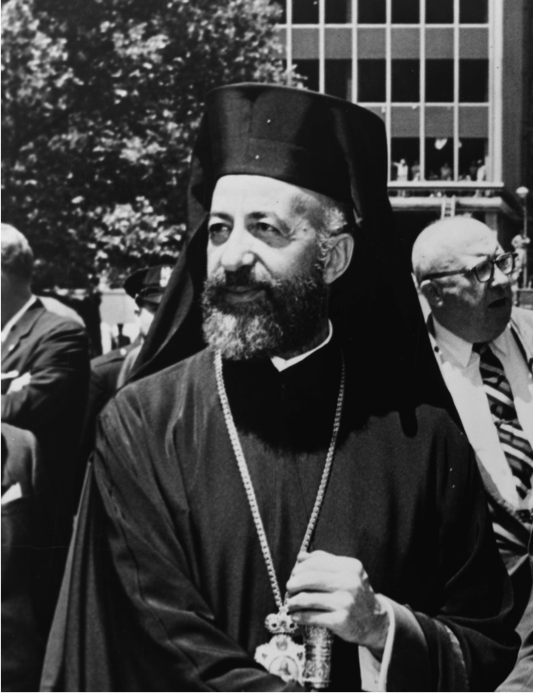 In addition to this embrace of irredentist Greek nationalism, key figures such as Archbishop Makarios linked the enosis struggle with Asian and African anticolonial nationalist movements. Throughout the 1950s, Makarios sought to “internationalize” the enosis question by establishing a network of contacts across the Eastern Mediterranean and in the United Nations. His overtures to the Greek government contributed to Greece’s 1954 commitment to inscribing the enosis question on the UN agenda. Makarios also traveled to Egypt, Lebanon, and Syria. Officially, these visits were intended to establish religious links with other Orthodox communities, but Makarios used his travels to build support for enosis among anticolonial Arab politicians and journalists. Due to his past studies in Boston and involvement with the ecumenical World Council of Churches, Makarios could also call on an extensive network among Christian groups in the United States. In 1952 he visited New York, where he lobbied UN delegates and publicized the enosis cause through speeches and radio interviews. When he traveled to Bandung in April 1955, Makarios hoped to raise support for Cyprus’ anticolonial struggle by emphasizing solidarity with newly independent Asian and African states. Although he spent much of the 1955-59 Cyprus conflict in exile at the behest of the British, Makarios continued his outreach to other anticolonial leaders. In April 1957, after his release from house arrest in the Seychelles, Makarios spent a week in Kenya lecturing and celebrating mass with Nairobi’s Greek Orthodox community. In 1957 and 1958, he met with Egyptian President Nasser on several occasions—Nasser’s Radio Cairo broadcasting service strongly supported Greek Cypriot aspirations during the Cyprus conflict. In 1959, after nearly four years of war, negotiations between Britain, Greece, and Turkey resulted in a series of agreements that ended the conflict and created an independent Republic of Cyprus. Faced with what was essentially an internationally imposed arrangement, Makarios accepted independence as an alternative to enosis. Many Greek-Cypriots reacted with surprise, but accepted independence nonetheless. After independence in 1960, tensions within the Greek-Cypriot community as well as between Greek- and Turkish-Cypriots contributed to the 1964 deployment of UN peacekeepers and, ultimately, the deterioration of Cyprus-Greece relations resulted in a 1974 Greek-sponsored coup that precipitated a Turkish invasion and the subsequent partition of the island. The anticolonial story of Cyprus’ Right-wing, religiously based, irredentist enosis movement reveals the importance of questioning our basic assumptions about anticolonial aspirations. Grounded in the post-1945 context of decolonization while embracing nineteenth-century Greek nationalism and aspiring to liberation from empire without seeking national independence, the Greek-Cypriot enosis movement was a hybrid entity. As such, it defies conventional ideas about anticolonial nationalism and decolonization. Foreign Office to Chancery, Washington, 10 Aug 56, FO 371/123911/1081/1652, The National Archives. A. W. B. Simpson, Human Rights and the End of Empire: Britain and the Genesis of the European Convention (Oxford University Press, 2001), 894. Richard Clogg, A Concise History of Greece, 3rd ed. (New York, NY: Cambridge University Press, 2013), 65; Clement Dodd, The History and Politics of the Cyprus Conflict (New York, NY: Palgrave Macmillan, 2010), 10-11. Yiannis Katsoulis and Ioannis Massos, “A Hymn for EOKA.” A Poetry and Prose Anthology of the 1955-59 EOKA Liberation Struggle. Nicosia, Cyprus: Cyprus Ministry of Education and Culture, 2003. p.34. Grivas, The Memoirs of General Grivas, 208. Clogg, A Concise History of Greece, 49. See Robert Holland, Britain and the Revolt in Cyprus, 1954-1959 (Clarendon Press, 1998), 25-32. Stanley Mayes, Makarios: A Biography (New York: St. Martin’s Press, 1981), 46-51; Holland, Britain and the Revolt in Cyprus, 1954-1959, 28. For Makarios’s activities at Bandung, see Midklethwait to Greenwood, 28 Apr 55, FO 371/117633/1081/377, The National Archives. Metropolitan Makarios (Tillyrides) of Kenya. “The Makarios Legacy in Kenya.” Orthodox Research Institute. http://www.orthodoxresearchinstitute.org/articles/church_history/makarios_tillyrides_makarios_legacy.htm. Accessed August 24, 2014. Nancy Crawshaw. “The Future of Makarios: Problems of return to Cyprus,” The Manchester Guardian, Sep 8, 1958.